Mahinda Rajapaksa was let down badly by the London based Commonwealth Business Council that had invited the Sri Lankan President to deliver the keynote address in a symposium organized by it for the Diamond jubilee of accession to the throne by Queen Elizabeth II of Britain. Intense political pressure mounted by Tiger and pro-tiger elements in Britain and Europe resulted in the C’wealth Business council abruptly cancelling the event in which Mahinda Rajapaksa was to participate on June 6th 2012. Although Mahinda Rajapaksa was ready,able and willing to deliver his address as planned the organizers wilting under pressure exerted by expatriate elements of the Liberation Tigers of Tamil Eelam (LTTE) unilaterally called off the morning sessions of the event in which the President was scheduled to speak without consulting him. The demonstrations organized by the LTTE and pro-LTTE sections of the Tamil Diaspora also revealed that the “war was not over” for some Tamils abroad. The military debacle suffered by the mainstream tigers in May 2009 may have wiped out the LTTE structurally and functionally in Sri Lanka but for the overseas tigers the war was still on. The statements and reports in the various media organs controlled by the overseas tigers and fellow travelers depicted the demonstrations protesting President Rajapaksa as a military campaign. They openly called it “Por” or war.More significantly those participating in the protests were described not as volunteers or activists but as “tigers”. A new term “Pulathup Puligal” has been coined and is being used. Pulam meaning land or territory has been used widely in recent times to denote those who have migrated to other lands from the traditional “Tamil speaking world” (thamizh Koorum Nallulagam) of India and Sri Lanka. In one sense they are “Pulam Peyarntha Thamizhar” (those who have left the land) but in another sense “Pulathu Thamizhar” could also mean Tamils in other lands. The term “Pulathu Puligal” is derived from this and could mean Diaspora tigers, overseas tigers, expatriate tigers or tigers abroad. The demonstrators most of them young men and women openly flaunted their tiger affiliation. They carried flags bearing the roaring tiger emblem of the LTTE. Many wore apparel with the tiger insignia. While desisting from explicitly identifying themselves as “LTTE” the demonstrators often chanted the slogan “Thamizharin Thaagam, Thamilzheezha Thaayagam” (The thirst of the Tamils is the Tamil Eelam homeland) which has been the defining slogan for the LTTE. Some even shouted out publicly “Our Leader Pirapakaran” in English. Although the LTTE is banned in Britain as a terrorist organization the British Police did not take any action against this open manifestation of LTTE identity or links. in such a way or in such circumstances as to arouse reasonable suspicion that he is a member or supporter of a proscribed organization”. Despite these provisions no attempt was made by any London bobby to even question the youngsters wearing apparel bearing the insignia of the LTTE or waving tiger flags. What is more these “Pulathup Puligal” were allowed to not only demonstrate or march on the streets but also to engage in many provocative acts including the burning of the Sri Lankan national flag. 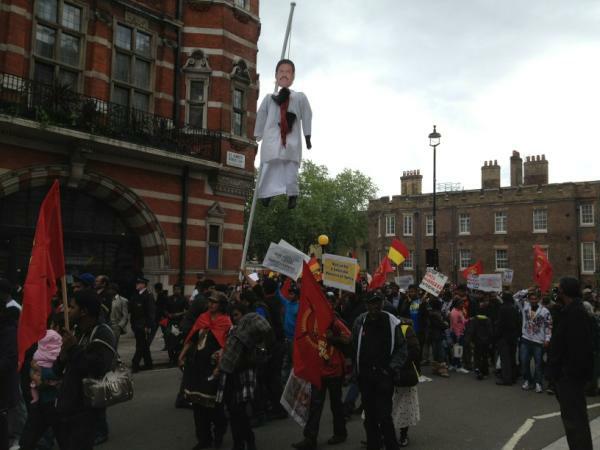 The demonstrators protesting President Rajapaksa’s presence in London achieved some success in getting the organizers of the Commonwealth Economic Forum to call off his key –note address.Apart from this setback the rest of Rajapaksa’s itinerary in Britain went through as scheduled. The President and the First Lady Shiranthi Rajapaksa attended the Commonwealth luncheon hosted by the Commonwealth secretariat in honour of the Queen.Mahinda and Shiranthi Rajapaksa were guests at receptions held at the Buckingham palace and Guildhall and also participated in a special Thanksgiving service at St.Paul’s Cathedral. Even though his sojourn in London was marred by protest demonstrations staged by members of the Sri Lankan Tamil Diaspora the President to his credit remained unfazed and defiant. There were also counter demonstrations in support of the President by Sri Lankan Sinhala and Muslim expatriates.At one stage Rajapaksa got down from his vehicle and addressed a group of supportive demonstrators despite the prevalent security threats. Given the current political atmosphere it was well known that President Rajapaksa would be the target of a Tamil Diaspora protest campaign in Britain.In December 2010 Rajapaksa had his scheduled address to the Oxford Union at Oxford University cancelled under similar circumstances. Nevertheless the President took a deliberate decision to travel to Britain to participate in events related to the Diamond jubilee of Queen Elizabeth’s accession to the throne. The British monarch was proclaimed Queen on February 6th 1952 when her father King GeorgeVI passed away. She was formally crowned as Queen on June 2nd 1953. Currently her the Diamond jubilee of her accession to the throne is being celebrated through a series of events. Given the fact that the Queen is the head of the Commonwealth consisting of 54 nations that were or are British colonies the celebrations are multi-national in nature. The saying about the Sun never setting on the British empire was due to the broad geographical spread of Britain’s former possessions. With Sri Lanka known earlier as Ceylon being a British colony from 1796 until it gained independence on February 4th 1948 the Sri Lankan President was naturally expected to participate in the Diamond jubilee celebrations. Sri Lanka though a republic since May 22nd 1972 is an active member of the commonwealth still. The president is both head of state and head of Government. Participating personally would improve the good relations between both countries and also illustrate the affection and respect with which the Queen is regarded by the Island nation. There was also another important reason for greater involvement by Sri Lanka in the affairs of the Commonwealth. Since 1971 there have been biennial summit meetings of heads of Government of Commonwealth known as CHOGM or Commonwealth Heads of Governments Meeting.There have been 21 such meetings held so far.The Queen as head of the Commonwealth has commenced the practice of attending such summits from 1997. Every two years the CHOGM summit is held in a different member state, and is chaired by that nation’s respective Prime Minister or President, who becomes the Commonwealth Chairperson-in-Office.As is well known ,the next CHOGM will be held in Sri Lanka in 2013. 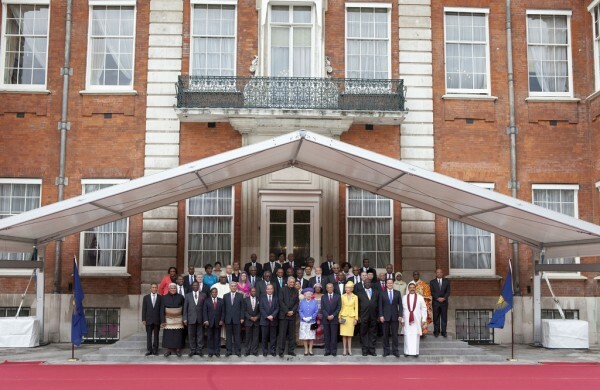 President Rajapaksa will chair the CHOGM in 2013 and then become the Commonwealth chair in office till 2015. This is seen as an honour for both the country and the President. Against this backdrop the Sri Lankan President may have deemed it imperative that he personally participate in Commonwealth events connected to the Diamond Jubilee. He and the first lady were extended an official invitations to the banquet on June 6th noon in honour of the Queen by Kamaleshwar Sharma the Secretary-General of Commonwealth. Frantic efforts were made by LTTE and pro-LTTE elements in the Tamil Diaspora and human rights activists to prevent the President from participating at the luncheon meeting with the Queen at the Commonwealth secretariat in Marlborough House.Fervent appeals were made to rescind the invitation. Crowds gathered in large numbers at the venue to protest. Despite these attempts the President Mahinda and Shiranthi Rajapaksa did attend the banquet and meet the Queen in person. There were however some stringent security arrangements aimed at avoiding friction.The British authorities were very keen to avoid potential trouble so that events concerning the Queen personally would not be affected adversely. They did not want their beloved Queen’s diamond jubilee celebrations suffer any hitch or mishap. It was under these circumstances that Rajapaksa agreed to forego his own limousine and travel to Marlborough House at Pall Mall in an unmarked vehicle belonging to the Metropolitan Police . The President and First Lady entered Marlborough House premises in a Range Rover bearing the number plate VX 12 CYY. The vehicle did not fly the lion flag for obvious reasons. Thousands of demonstrators mainly young Tamils from England,Scotland, France,Germany and Switzerland massed outside Marlborough House ,chanting slogans against President Rajapaksa . They also waved placards and held banners aloft. An effigy of the President as if hanging on the gallows was also dragged and carried about.It was later burnt. A recurring theme in the slogans chanted was “Sri Lanka President War Criminal”. This cry went up loudly whenever a guest arrived. The shouts echoed around the forecourt as each of the 70-75 guests went in. When the demonstrators realised too late that President Rajapaksa was in the Range Rover they began hooting and jeering. But the vehicle went inside premises smoothly. 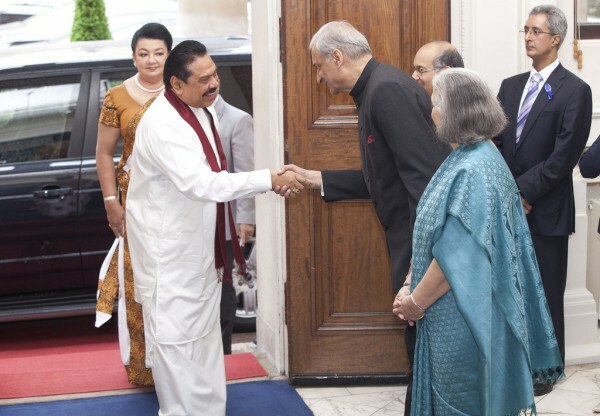 Though security reasons compelled the President to make a low –key entry he and Mrs. Rajapaksa were welcome guests at the Commonwealth banquet. The mood inside was in stark contrast to the heat and passion displayed by protesting demonstrators outside Marlborough House. Kamalesh Sharma greeted the Rajapaksas personally and also introduced the President to a few of the other guests. The demonstrations outside made the Sri Lankan President the object of attention among fellow guests. 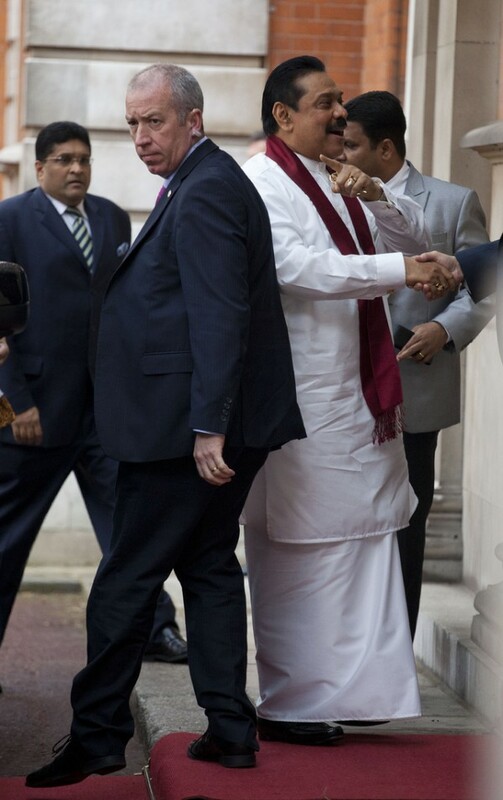 According to an official attached to the Commonwealth secretariat many of the leaders were seen approaching Rajapaksa and exchanging pleasantries with him. A diplomat from a Western nations stated that he was impessed by the Sri Lankan president maintaining a dignified composure in spite of the insulting protests outside. He was “calm and cool” he said. The star of the event was undoubtedly the Queen herself. With Prince Philip being hospitalised over a bladder infection she came alone. The Queen was wearing a floral print dress in shades of blue and grey and a blue wool crepe hat. After being handed a bouquet of flowers by Aduke Badale the nine year old daughter of a Commonwealth secretariat employee the Queen began warmly interacting with the guests. Greeting Mahinda and Shiranthi Rajapaksa in the Blenheim Salon, the Queen shook hands with them and engaged in short conversation .She seemed quite relaxed.According to sources ,reports appearing in British newspapers that the Queen “shook hands fleetingly”with Mahinda are wrong. The Constitutional monarch engaged as long as possible as she could on the occasion where she met many guests within a short span of time. The Rajapaksa couple was seated with others like Babli Sharma, wife of the Commonwealth Secretary- General, Namibian President Hifikepunye Pohamba and his wife, and New Zealand Prime Minister John Philip Key and his wife. The guests were served smoked salmon avocado terrine with a Brie tartlette followed by wild sea bass then an apple crumble souffle, apple pie ice cream and caramelised apple.A variety of choice wines from South Africa like Vergelegen, Escenzia, Bilton,Hannelli, Syrah and black label pinotage were available to soothe the palate. Later on when the official group photograph of the Queen and guests were taken , Cameron and Rajapaksa posed side by side. The Sri Lankan president was on the extreme left of the front row standing next to the British PM. This is a sight that could irritate the Diaspora demonstrators considerably. As stated earlier apart from the Commonwealth luncheon and other receptions there was another event scheduled in the morning in which the President was to have played an important role. He was to deliver the keynote address during the morning sessions of a symposium organized by the Commonwealth Business Council. The two –day event on June 6th and 7th titled“Diamond Jubilee Commonwealth Economic Forum” was to be held at the Mansion House in London.Tickets for the event priced at 795 pounds plus taxes had been sold out in advance. It would be relevant at this juncture to know something about the Commonwealth Business Council and its objectives gleaned from its official website -. The Commonwealth Business Council (CBC) had come into being after the CHOGM at Ediburgh in 1997.The CBC acts as a bridge for cooperation between business and government, between developed and emerging markets and between large and small businesses. With the Commonwealth’s member countries accounting for 30 per cent of the world’s population and about 25 per cent of its international trade and investment the CBC has vast potential. Commonwealth countries together amount to about 40 per cent of WTO membership. The CBC helps to mobilise investment into Commonwealth countries through measures including facilitating access to international capital markets; strengthening domestic capital markets; encouraging regional integration; committing the private sector to work together with governments to help achieve a successful market economy for generating investment. The CBC has been working to involve private sector engagement in facilitating the implementation of an Information Communications Technologies for Development programme. The CBC programme enhances collaborative partnerships between the various stakeholders including governments, private sector, donor agencies and civil society. It is in the context of the Commonwealth Business Council remaining committed to private sector led development and ‘making globalisation work for all’, that it organized its Diamond Jubilee Commonwealth Economic Forum. The theme “reshaping capitalism for global prosperity and sustainable growth” was adopted for the economic forum. The Economic Forum which President Rajapaksa was to participate in was to focus on highlighting the positive impact business has on society. It was to address economic policy issues around free and fair trade, employment and skills, support for small and medium sized enterprises, food security and short term decision making. It also intended to focus on areas where businesses can make a difference such as socially responsible investment, supply chain management, environmental sustainability and frugal innovation for pro‐poor growth. Above all it was to consider how more effective public private partnerships for the benefit of all could be established. Apart from President Rajapaksa those scheduled to address the Economic Forum organized by the Commonwealth Business Council at Mansion House,London were the Zambian president Michael Sata and several Chief Executive officers and economists of prestigious commercial establishments and financial institutions. For the Sri Lankan President the occasion held tremendous significance. In November 2010 , President Rajapaksa had arrived in Britain to address the prestigious Oxford Union at Oxford University. Threat of protest demonstrations against the event by LTTE and pro-LTTE diaspora elements compelled the organizers to cancel it at short notice fearing a breach of security and possible violence. Even though the Thames Valley Police who were in charge of Oxford area was prepared to provide adequate security the Oxford Union decided to cancel the address by President Rajapaksa. This writer at that time wrote about the incident in these columns and also sent an e-mail seeking clarification on some related issues to James Kingston the Oxford union President at that time who had taken the decision to call off the President’s talk. Since his reply arrived late I had not utilized it so far. However I want to reproduce his reply now as I think it has some bearing on what happened under somewhat similar circumstances where another scheduled address by the Sri Lankan president was unilaterally cancelled by the organizers themselves. Many thanks for your email; I entirely understand why you might feel moved to ask me these further questions. The decision made to cancel the President’s talk was an incredibly serious one, and one I did not take lightly. I made it after consulting other Union office bearers, the Police, and representatives of the University as a whole. The police advised me that, though they had a plan in place, they could not guarantee the behaviour of the crowd, not that it would not grow further. I was advised there was a serious public order risk, and a serious risk of major disruption to the activities of the local community. At 5000 protesters, it would have been the largest demonstration seen in the history of Oxford, and the risks would have increased accordingly. I was further advised by the Union’s own security team that the Union would have been put at great risk of break in by the protesters: in 2007, at a smaller protest, the crowd had rushed over the walls and into the building. I could not put President of Sri Lanka under this risk. The President was informed by the Union that the cancellation took place; I was asked by a member of the President’s liaison team to fax a letter in to the High Commission, and did so. It would have been a grave discourtesy not to so notify the President, and it is not one the Oxford Union would commit. I was in extensive communication with members of the President’s liaison team prior to this point. I had no meetings with Tamil activists. The Union holds an apolitical stance; we do not make political gestures. I stand by my invitation to the President, and had looked forward to his speech with great excitement; however, this decision was taken purely upon security grounds and no other. This decision was made after full consultation with other Union office holders. The University holds no power in the Union. As stated earlier I have reproduced the e-mail from former Oxford Union President James Kingston now because of the spirit of déjà vu that prevails then and now. Earlier after the cancellation of the Oxford Union speech President Rajapaksa issued a statement. In the statement at that time, President Rajapakse said “I am very sorry this has had to be cancelled, but I will continue to seek venues in the UK and elsewhere where I can talk about my future vision for Sri Lanka.” The Mansion House speech on June 5th was to have been his first such address in the UK since the Oxford event was cancelled in December 2010. Unfortunately for President Rajapaksa his goal of addressing the Commonwealth Economic Forum too was not realized. Although the Business Council had not given any reasons for the abrupt cancellation speculation was rife that the decision was taken on account of the huge controversy generated by President Rajapaksa’s anticipated address. Tamil Diaspora media had been appealing to fellow Tamils to gather in large numbers at the Mansion House venue saying the British Police had stated that the event may be called off for security reasons if a crowd exceeding 20,000 gathered at the place. With the course of events taking a dangerous turn the Commonwealth Business Council office-bearers held an emergency meeting to discuss the situation in consultation with British law enforcement authorities. It is learnt that security assessments and intelligence reports were also examined. According to Scotland Yard sources the Police were ready to guarantee President Rajapaksa’s security but the Commonwealth Business Council decided it was not in the CBC’s interest to stage the event due to excessive policing requirements, risk of unruly incidents and potential violence, and also the likely disruption to business in the City of London. Thereafter the Business Council decided to cancel the entire morning session of the envisaged Economic Forum. According to a British official who requested anonymity the decision was to avoid potential “ugly incidents” in the Mansion House vicinity by eliminating the key factor capable of triggering a crisis. This key factor was identified as the scheduled address by President Rajapaksa! However in a bid to spare President Rajapaksa embarrassment by cancelling his speech alone the organizers resolved to call off the morning session of the forum in its entirety. Thus President Rajapaksa’s scheduled address has not been singled out separately and cancelled. Instead his speech along with other speeches are not on the agenda as the entire morning session was called off. The important question however is why did the President place himself in this predicament and make himself vulnerable to decisions made by weak forces incapable of withstanding pressure? What are the facts and reasons that led to this decision and what is likely to happen hereafter? What are the contours of the volatile demonstrations by the LTTE and pro-LTTE elements of the Tamil Diaspora and what are the ramifications of this unhealthy phenomenon?